In December 2012 the Center for Genomic Gastronomy participated in the Nomadic Science Hack Lab in Prague. We used our time in the lab to prototype methods for reverse engineer spice mixes such as masalas, Speculoos and KFC’s secret spice mix. 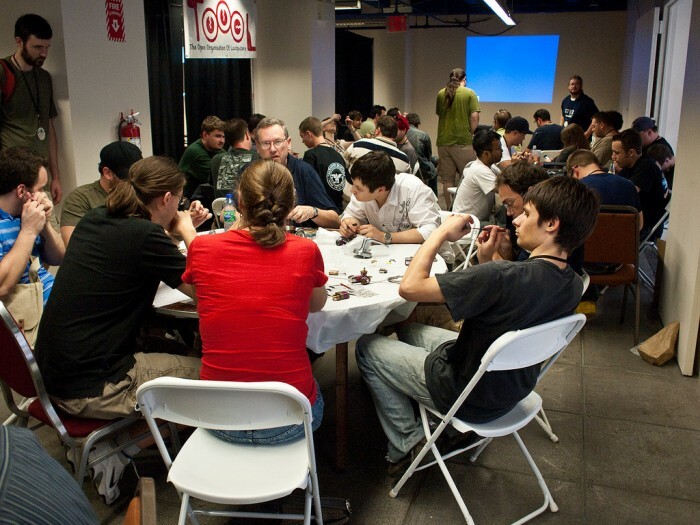 One of our main inspirations was the lock-picking villages that appear at hacker conferences. We would love to create a similar collaborative/competitive environment for reverse engineering spice mixes. This lab was our first attempt at Culinary Forensics and we chose to work with spices because they are dry, and easier to separate than other food products. Also, spices are highly fungible. Spices can travel far. The spice trade is worth a lot of money. Spices are essential inputs for industrial food design. For all of these reasons we are researching spices. Culinary Forensics can be used to reverse engineer recipes or to identify the makeup of a food product. Even though recipes can not be copyrighted, they are not necessarily set down in writing and published. Sometimes chefs and food hackers just forget to share their research, or run out of time to document their recipes. Other times consumers are sold adulterated food or mislabeled fish. Culinary Forensics can help. Creating an open source Culinary Forensics Kit could be useful in the move towards an open (food) culture. Although there are for-profit food reverse-engineering companies, our goal is to create free and open methods and tools. Spices are traded on a planetary scale. The edible genomes that were propagated globally during the Columbian Exchange (potato, corn, sweet potato, chili, tomato, tobacco, chocolate) may have had a more disruptive effect on agriculture and political economy, but the global spice trade paved the way. (The book “1493” provides a good summary). Potato, Corn and Sweet Potato spread across the planet because they are agronomically robust genomes that can produce calories and (some) nutrients on marginal and disrupted land. The global flows of spice that preceded the Columbian Exchange and continue to this day provided something more amorphous: exotic tastes, smells and powerful flavor experiences. Chili, chocolate, cinnamon and nutmeg go straight to our head. The internationalization of chili, tomato and potato and the spread of spices means that mankind is now Eating in the Homogenocene. Food moves slightly slower than writing, video and audio around our planetary networks, but not much slower. “A food manufacturer doesn’t want a truckload of ginger; they want a containerload of a ready-made flavoring mixture. Enter McCormick: the flavor company.”(TOC) Companies like McCormick shape and then capitalize on changing taste preferences, mellowing exotic flavors for domestic markets, and creating entire corporate cuisines which can be dropped anywhere in the world without regard to ecology, season or tradition. Spices are closer to pure information than most other foods. Pssst. The secret’s out at KFC. Well, sort of. Colonel Harland Sanders’ handwritten recipe of 11 herbs and spices was to be removed Tuesday from safekeeping at KFC’s corporate offices for the first time in decades. 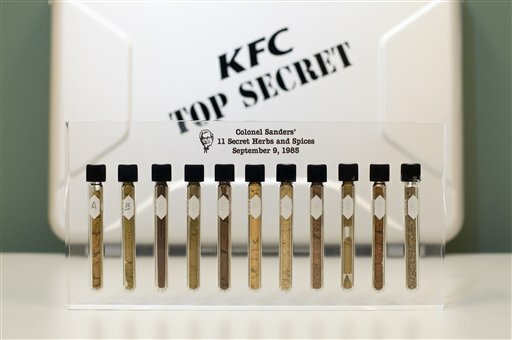 The temporary relocation is allowing KFC to revamp security around a yellowing sheet of paper that contains one of the country’s most famous corporate secrets. The brand’s top executive admitted his nerves were aflutter despite the tight security he lined up for the operation. So important is the 68-year-old concoction that coats the chain’s Original Recipe chicken that only two company executives at any time have access to it. The company refuses to release their name or title, and it uses multiple suppliers who produce and blend the ingredients but know only a part of the entire contents. Assuming it is accurate most of the handwork is done for reverese engineering the mix. We already know the number and color of each of the 11 spices. Other foodhackers have gone before us. Once mechanically separated taste, sight and smell can be employed to identify the ingredients. In cases where that is impossible, other physical and chemical and biological diagnostic tools (chromatography, etc.) can be developed, and added to a growing tool kit for a more general Culinary Forensics that goes beyond spice mixes. WindUp Girl. . . . There is an argument to be made for Open Source biotechnology that goes something like this: The (biotech) genie is out of the bottle. Better that many individuals and institutions have access to the tools of biotechnology. It may surprise many readers that even Michael Pollan has made this argument! 1. Ideologically we want science and industry to be open and transparent endeavors, and if Biotech is not going away, it needs at least be open, testable and verifiable by many minds. 2. Both science and industrial practitioners have used the metaphor of biotechnology as being like computer code. Extending this metaphor means that we would want a large and distributed network of biohackers checking code, and ready to respond in the case of an emergency. [ 1 ] In the autumn of 2012 one person emailed us and asked if the Center for Genomic Gastronomy could help her find out what was in a spice blend that Grandma left behind. At the time we didn’t have the tools, so we realized we would need to discover or create the tools to do so. It is also horrific to learn about how those particular spices entered the world market. The absolute despotism of the Dutch East India company in the Spice Islands is recounted in grim detail in Part 3 of The Taste of Conquest.